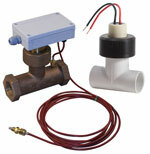 Badger Meter’s Series 380 and 735 Flow Sensors are designed to provide an all-in-one energy measurement solution. The Series 380 is made for HVAC contractors and energy engineer specifiers. The 380 comes with a pulse output, tee, two temperature probes, Btu calculator and RS-485. The 735 features a plastic tee-type, non-magnetic impeller flow sensor, and is made for small pipe size applications. The 735 has an internal preamplifier that allows a pulse signal to travel up to 2,000 feet without further amplification.